C.S. 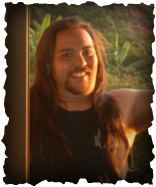 Revlis was born and raised in Hawaii. He worked hard throughout his youth, not having time to develop his creativity. He met his wife working at a local supermarket and they were married the next year. Their joy was quickly over run by sadness by the sudden loss of his father-in-law, to whom the first book is dedicated. After a difficult first year, C.S. Revlis picked up the pen and began creating the world of the Vampire. Through countless ups and downs, he continued writing, completing the first book in 2009. He began submitting his work to publishers and agents, they all declined. Finally losing faith in the big publishers, he opted for self-publishing. C.S. Revlis has completed the second book in this series, although it is not availble for purchase yet. He is currently working on the third book. There are a total of five book planned at this time, but only time will tell how many will be released.